On Friday night, terrorists stormed a rock concert and a restaurant in Paris, as well as detonating bombs outside the Stade de France. At the time of writing, 132 people have died from the horrific attacks, with hundreds more injured, some critically. Landmarks across the world, including Tower Bridge and the Sydney Opera House, lit up in the colours of the French flag in solidarity, with countries across Europe today falling silent at 11am to pay respects. I was working on a national newspaper website, the Daily Star Online, over the weekend, and it was the biggest story of the year. People in their thousands were reading every single update, with every news website shunning all other stories for blanket coverage of the atrocities. 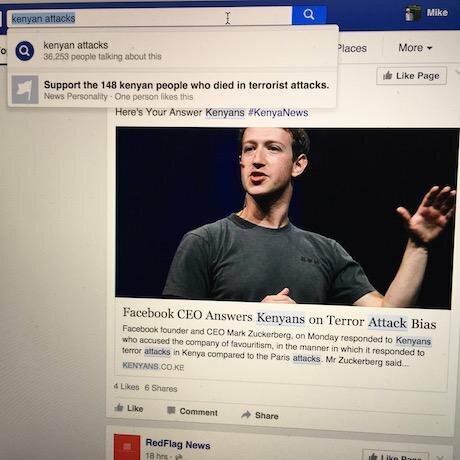 But in the aftermath of the Paris attacks, many people have taken to Twitter and Facebook to complain about why 147 people being killed by militant gunmen at Garissa University College in Kenya didn’t get as much coverage as Paris. “Why isn’t the media covering this?” I saw several Facebook posts exclaim, while sharing a link to a BBC News story on the tragedy. a) The media did cover this. You are sharing a BBC News link to the story. b) A quick Google search will show that it wasn’t just the BBC who covered it. Al Jazeera, CNN, New York Times, USA Today and Washington Post are among the publications who wrote about it at length. c) You obviously just didn’t click on the story to read it. Even when sharing it, because if you had read it, you’d have realised the college massacre happened in April. Yes, foreign affairs stories aren’t covered as much as stories closer for home. This needs to be worked on by the media, and is a big issue. But this is not because an innocent person being killed in Beirut or Iran is less important than a white European being killed. It’s because less people read about it. Everyone seems to have got up on their high horses after Paris saying how horrible the media is for belittling tragedies outside of Europe and the US, but as anybody with access to their news site’s analytics will tell you, people don’t care as much. A story about a town being blown to pieces in, let’s say, Lebanon may get a couple of thousand hits. The Paris attacks got thousands of hits every minute. Unless it’s local in proximity or culture (like the States), people just won’t click. A lot of people assume that a bombing in the Middle East happens every day but woah — if it has happened in Paris, it could happen to us. I have noticed several stories on sites, including national news site Metro, asking why Mark Zuckerberg didn’t offer a Lebanon flag profile pic filter after 47 people were killed in ISIS suicide bombings in Beirut last week. But be 100% honest with yourself — would you have used it? Of course not. Because unless the story is presented to you on Facebook alongside a string of sad face and broken heart emojis, you probably didn’t hear about it. And even if you did, you wouldn’t be publicly showing your support for Lebanon. Read international sites. Follow an assortment of news outlets. Don’t complain that the media didn’t tell you about a tragedy on the other side of the world. They did. You just didn’t click.